Lately, Madelyn’s imagination has been spiraling into worlds I didn’t know she even knew existed. It’s so fun to hear her describe these places I can’t see, but she seems to experience at full force. Hearing her language paired with her excitement is one of the best forms of entertainment I think I’ve ever enjoyed. Since I knew my car hadn’t teleported us to England and we also weren’t watching Game of Thrones that moment, I realized this was another episode of Madelyn’s Imagination, LIVE!. 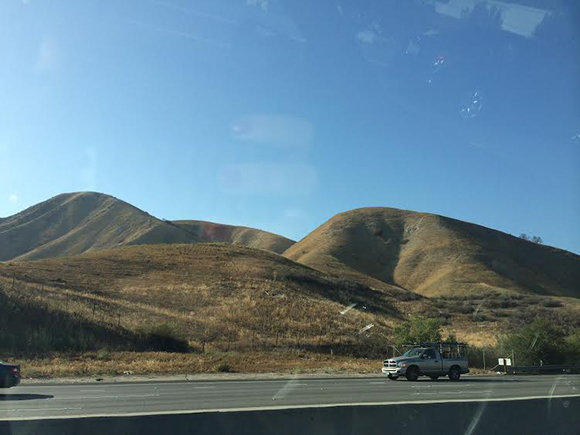 While keeping my eyes on the road but also satisfying her enthusiasm — and, let’s face it, my own curiosity — I matched my line of vision with her finger pointing and saw what she “saw” outside my driver’s side window. Madelyn makes castles appear out of nowhere. In another instance, I went to her room one morning when I heard she was awake. I could hear on the monitor that she was playing in bed and having a blast, and I wanted to catch her in a good mood instead of when she was pissed and done being in her crib. She happily greeted me and told me all about her “friends” — the dolls and stuffed animals she sleeps with. She mentioned she was ready for breakfast so I scooped her out of her crib and set her down on the rug. I never do this, but for some reason, I felt motivated to tidy up her crib sheets, so I picked up both blankets and folded them up and stacked them on the sides. She wailed, quite unhappily. “MOOOOOOOOOOMMYYYYYYYYYY!!!!!!!!! !” What?!?! I make your bed and this is the thanks you give me? I asked her what happened, what did I do. Dejected and forlorn, she crossed her arms and muttered in the saddest voice an almost three-year-old could express: YOU RUINED MY CASTLE. What castle? I didn’t see a castle. There were two blankets and they’d been thrashed around and intertwined. But, no. Madelyn explained to me that before I came into her room, she had made a castle with her blankets and the princesses lived in there (again with the commune?) and now I ruined it. I actually felt really bad and apologized, but she dragged her feet out of the room and clearly needed a moment to recharge. She soon recovered from the emotional trauma I caused when I bulldozed her blanket castle, but I no sooner learned my lesson that I should ask before I move whatever object she’s imagining up. 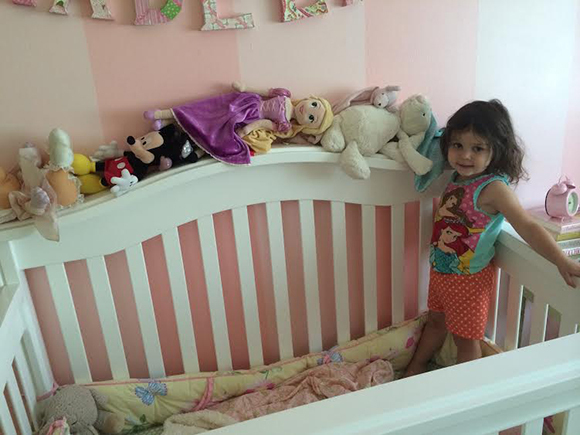 A lot of magic seems to happen in her crib. Another morning I eavesdropped outside her door to hear her encouraging her “friends” to climb the monkey bars. After a few minutes of listening to her cheerleading, I couldn’t take it anymore and I had to see this playground in her crib. Sure enough, she was helping each doll or stuffed animal climb the vertical bars of the crib (monkey bars) and land in a position she deemed favorable (usually lying down) on the top of the crib. She showed me how each one got up, and demonstrated with Miss Piggy: “It’s OK, Piggy! You can do it! There ya go!” and then when Piggy got to the top it was, “Yay! Good job, Piggy! Good job!” So supportive. She almost had all of them stacked on top when Ariel fell down. I picked her up and gave her to Madelyn who coddled her in the corner of the crib, rubbed her back, kissed her, and said, “It’s OK, Ariel. You’ll be OK. Feel better now? Ready to go back up? YAY!” So nurturing. When Madelyn came out of her crib to come downstairs for breakfast, she told me she wanted to leave her friends on the playground to play while she ate. 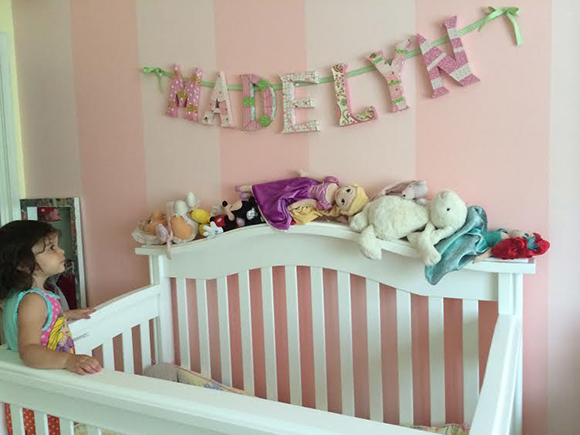 From castles to playgrounds, Madelyn’s world is full of good times. Visiting these places through her eyes is fascinating and I hope her imagination never stops working! Now, if only she could imagine up a hair stylist to fix her bed head.